Residence 4F at the iconic Apthorp Condominium exemplifies the grandeur of New York's Gilded Age paired with an effortless blend of modern convenience. This completely gut renovated 3 bedroom, 3.5 bathroom home, with its hand-cut marble mosaic entry gallery, chevron oak floors, and hand crafted ceiling moldings, is the epitome of pre-war sophistication. 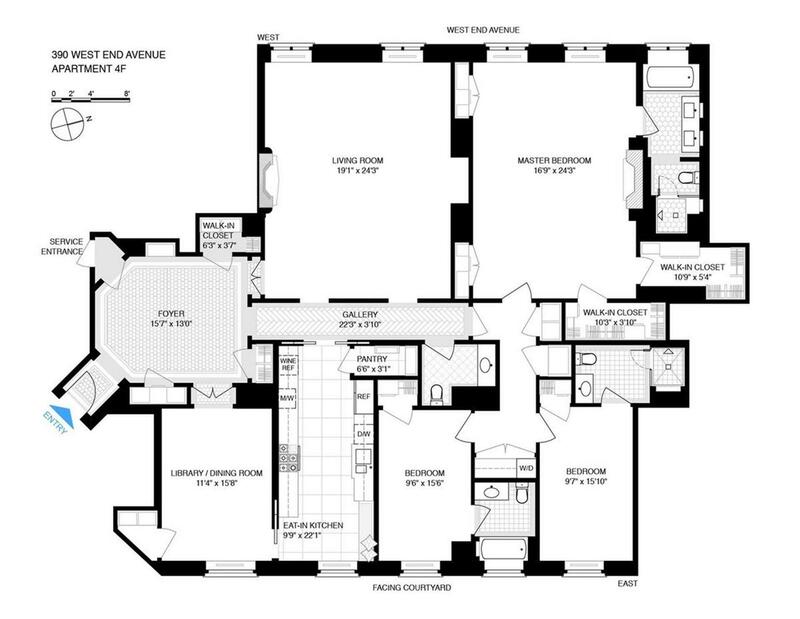 This well-scaled floor plan features a west-facing living room with fireplace and an opposite, east-facing formal dining room, both accented by ornate moldings and lavish chandeliers. The large, windowed-kitchen offers ample space and function for even the most discerning chef. Exposures to the west and east allow for an abundance of natural light throughout this residence all-day long. The master suite features west facing views, two large walk-in closets, a fireplace and a gorgeous, marble clad bathroom. This home's second and third bedroom suites are beautifully proportioned, both have en-suite bathrooms and feature ample closet space. Washer/Dryer in-residence, Central AC and climate control are also all provided. Built by William Waldorf Astor in 1908 and listed on the National Register of Historic Places, The Apthorp is a full-service building and a treasured New York Landmark renowned for its Italian Renaissance Revival architecture and private courtyard drive. The gated entries and lobbies are attended full-time and the building features an on-site parking garage, 6,500 square foot amenity suite with a fitness center, entertainment suite and children's playroom. Bike storage and individual storage rooms (by license) are available.